Introducing Every Stage™, the ultimate transporter designed and engineered to make growing up easy from birth to 12 years. Four seats in one, Every Stage™ adjusts, adapts and protects through groups 0+, 1, 2 and 3. Thanks to its AutoAdjust™ technology, the head rest and side wings grow up and out simultaneously, ensuring maximum comfort for growing riders all the way up. The Every Stage™ has five recline positions; one rear facing and four forward facing. Guard Surround Safety™ side impact protection panels add extra layers of security, while the reinforced steel inner seat shell increases structural integrity upon impact, meaning Joie has designed this seat to be as safe as possible. 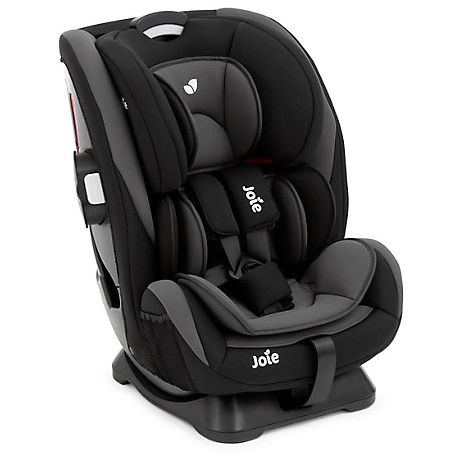 As with all Joie products, the Every Stage car seat is feature rich and includes a one-hand, ten position height adjustable headrest, grow-with-me infant and toddler inserts that are customisable for an ultimate fit at every stage, and a custom Harness Hideaway compartment that stores the 5-point harness for booster mode. The Grow Together™ multi-height headrest and harness system adjusts simultaneously and requires no re-threading of the harness. This is a terrific car seat that offers fantastic value for money. It’s unique design grows with your child allowing you to use it from birth all the way up to 12 years, so you will never have to purchase a second or third car seat. The fact that is offers both forward and rear facing up to 4 years is a real plus. The is really nice and padded and the recline is a very useful feature, especially when it comes to sleeping babies.